It is the first ever (as far as we’re aware) comparative survey of FTTP and DSL broadband users looking into usage, attitudes and perception of broadband solutions. 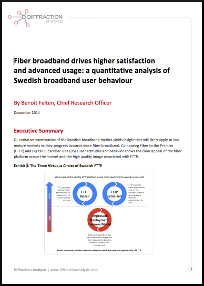 This survey focuses on Sweden and was undertaken in collaboration with the FTTH Council Europe. It focuses on the most mature market in Europe, but is part of a broader piece of work with annual surveys covering various European countries where FTTP is in deployment. The key findings in this report (of interest to both fiber broadband operators and policy makers) highlight how a market’s fiber maturity affects usage and perception. This is a must read for any operator active in markets where FTTP is being deployed and commercialized.